This is the view of Milligan College taken from 3 miles away on White Rock, an overlook near the top of Buffalo Mountain (click photo to enlarge). White Rock is a popular destination of hikers desiring a clear view of Johnson City, TN and the mountains to the south and east of the city. Getting there is tough -- Pretty much any trail you take will be very steep. I recommend a cool, clear day for this one and that you take some water with you! 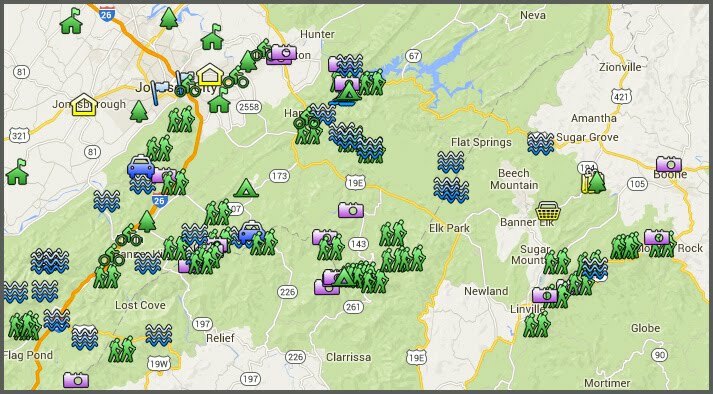 There are three trails from the "Alternate Trail Head" (click here for a terrific map of the Buffalo Mountain trails). The Tower Ridge Trail takes you to the familiar towers atop the mountain near White Rock, but is insanely steep. The second way to White Rock is to simply hike the gravel service road to the top -- but this also is a very steep route (and quite boring). Finally, there is the White Rocks Trail which is the one I would recommend. It is a total of 1.54 miles from the Alternate Trail Head, and while parts of it are indeed steep, it offers a more scenic route with a somewhat gentler grade up the mountain. For directions to the park, click here.